By now, I hope you’ve all checked out the current sale. The awesome folks at Fluevog just gave us more reasons to shop: an additional 15% off all sale shoes this weekend (ends Sunday, July 30th. See the site for details). Savings on top of savings?! Yes!! I finally got around to perusing my phone to sort out all the photos I’ve taken during various trips to Haight Street. (Can I just say that I’m so happy to be home?!) Guess what? I have even MORE pix (and quick reviews) to share! Here it goes! Ishshoes | Quiver. Size 10 (I needed 9.5). I was very hesitant to try these because I don’t like heels that typically dent in like these. Plus, pointy toes are a no-go for me. These, however we’re a surprise because the footbed felt really spongy. For a heel like this and the pointy toe (which I do not typically like), it was very comfy and stable. Entrance | Room 213. Size 10 (The 9.5 also fit, but I wanted extra wiggle room for an insole to maximize comfort). I would have NEVER batted an eyelash for these. The high heel along with the pointy toes are an automatic no-no for me. In fact, the only reason I tried them on is because my friend Glenys expressed interest and asked me if I knew anything about them. Since I was at the store, I told her I’d try them on and give her my honest opinion about them. 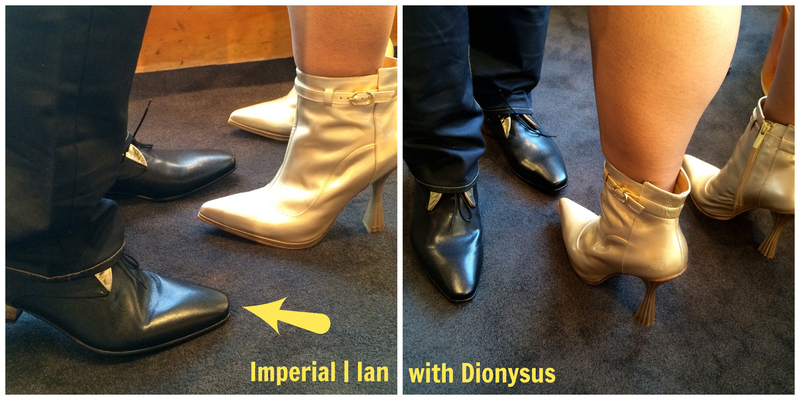 Let’s just say that after tried them on, I gave Glenys my approval to dive in to her first Fluevog purchase. (She has since purchased a second pair in her growing collection. YAY!) The pitch on these lavender/blue lovelies is very friendly to my Flintstones (my flat feet), and the toe box is surprisingly roomy. Finally, the “dragon” leather along with the center buckle are beautiful details. Kickback | Type 1. I’m always sad that we can’t do much for the men’s collection by way of reviews. We can, however, simply provide pix that the Huz kindly modeled for us. This is a simple sneaker that’s currently on a deep discount. I say you act fast!! Modvogs | Ace Face. I’d like to thank the Huz (top photo) and Dorothy’s Manpanion (bottom photo) for entertaining my request to try these on. Though hesitant at first, the Huz found these incredibly comfortable and was surprised at how much he liked the color on these. If you look closely at the heel, the orange detail is brilliant! Whew! Alright. You have about a day or so left to take advantage of the additional 15% off sale Fluevogs. If you know what’s good for you, you’ll head over to your nearest store or log on to the site ASAP! Not interested in the sale stuff? No worries. Fall 2017 is slowly trickling in and OMG some of these will bring tears to you eyes. Seriously!! Happy shopping! Categories: FlueReview, FlueSteals, Sale | Permalink. If you haven’t hit the current Fluevog sale yet, I have no words for you… (Alright. I kid.) 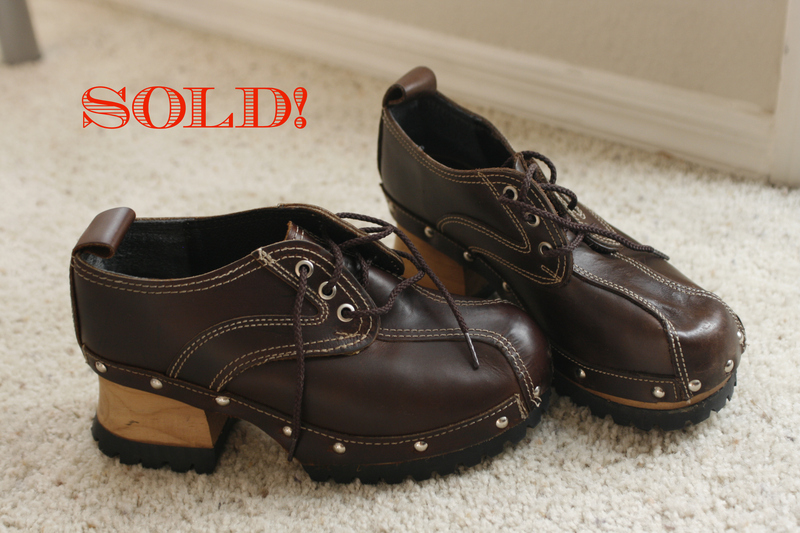 Recently, the lovely folks at Fluevog marked down even MORE gorgeous shoes for all to purchase. (To be honest, there are a number of surprising markdowns, so make sure to check it out!) With that, I wanted to share the last of the reviews/pics Shirley and I had in store for you. 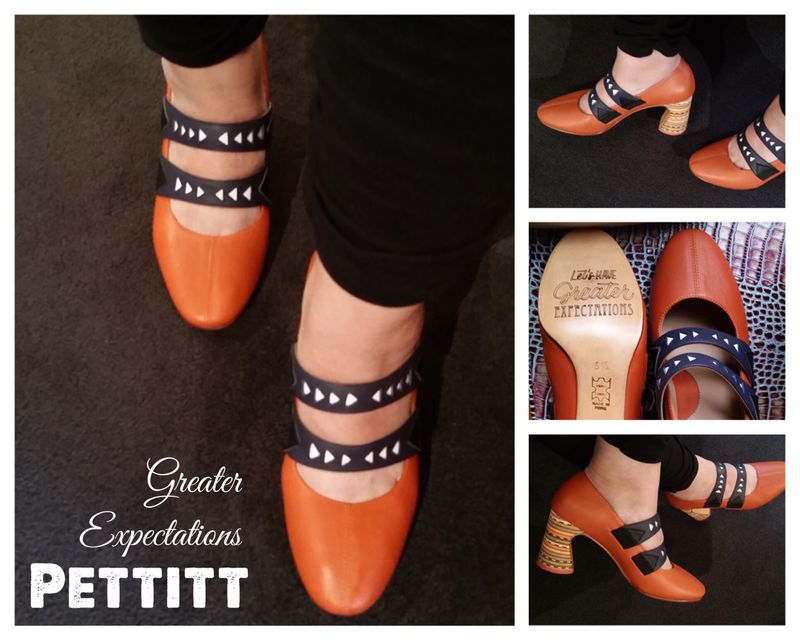 Greater Expectations | Pettitt. (Joanne’s feet.) Size 9.5. I tried these on, only because Madam Shirley urged me to. She described them as feeling like a simple pump. Since I’m not big on pumps, I wasn’t super enthusiastic about them. However, Shirl is right. These do feel like a typical pump. The toe box was pretty generous and these just have a really unique look – especially with the orange leather, as well as the details on the heel. I didn’t like how slippery they were on the carpet, so like a number of heels I own, I’d likely take them to a cobbler to put in a no-slip grip on the bottom (you can also do that yourself, but I like the cobbler versions better). If you’re looking for a comfy pump in a unique orange (which surprisingly goes with a lot – especially if you’re into blue colors), this is for you. Views | Modotti (Shirley’s feet.) It must be noted that Shirley fell in LOVE with these. I can’t give exact notes on fit, but while trying these on, she wore these around the store most. Though it’s a high, hearty heel, these are surprusingly very stable and comfy. Enneagram | Giver (Joanne’s feet.) Size 10. I am and will always be a HUGE Minis fan. Naturally, my heart broke when I heard they were going bye-bye. I should have known that the FlueGods would would have an equally wonderful addition to the collection. Though I do not own anything from the Enneagram family (waiting on the perfect color combo), I do adore trying them on because they are even more comfy than my beloved Minis. The lower, flatter heel is sheer perfection! The Giver reminds me of a lower cut QTee. Mind you, I wear the QTee regularly, especially when teaching or interviewing for jobs. I love that you can do straight across, or do a criss-cross on the straps. Though I tried on size 10 in these, I really need them in size 9.5. Have you seen the fall line yet?! I have only tried on a few things, but OMG, I’m in love with everything I’ve seen so far! We can’t wait to try some new things on and share them with you! 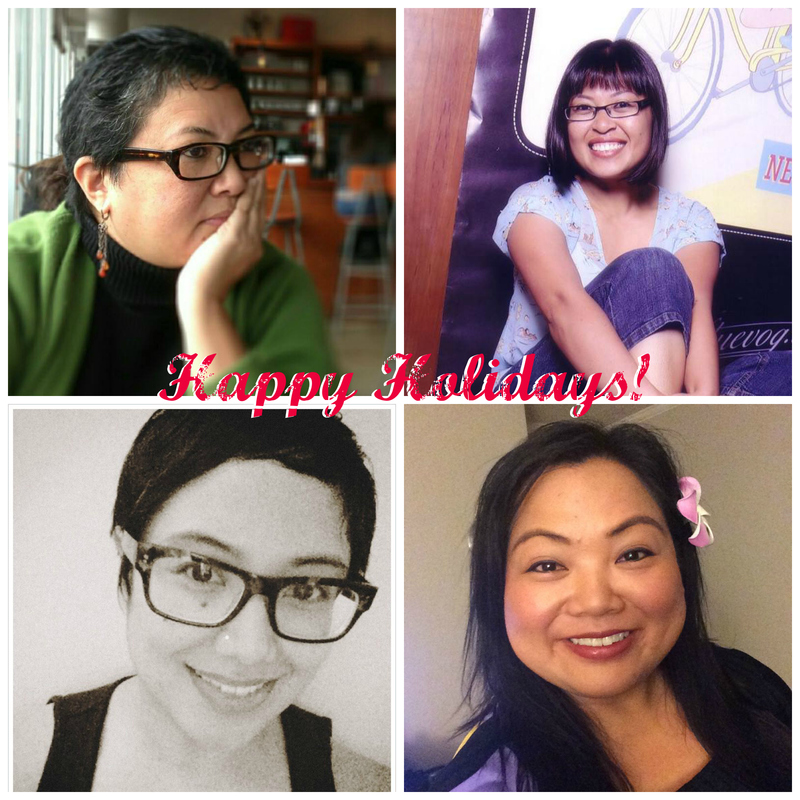 We just wanted to say hello and happy holidays! We hope you and yours have a wonderful holiday with your loved ones. For those of you who are having a less-than-stellar year end, please know that we’re rooting for you and sending some much-needed well wishes your way. As always, thank you for your support and we look forward to another year with you. For now, we just wanted to remind you that there’s an awesome Fluevog sale going on. Click on the banner below for more details. Also, don’t forget that Raspberry Heels and Gravity Pope have some great things going on too! As always, please share your new additions to comments. We love seeing your new goodies! Does anyone remember this Spandau Ballet song? 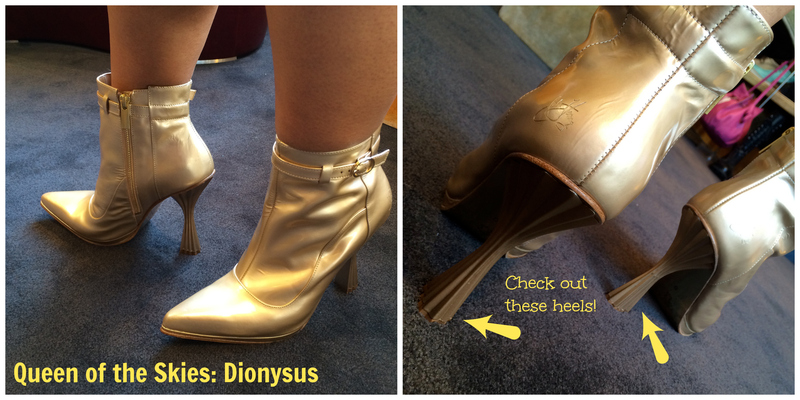 The first pair I tried on were the Queen of the Skies | Dionysus. In truth, I was really hesitant about this collection because the heels – though absolutely stunning – are 4″ high. However, Queen of the Skies | Dionysus was a lot more wearable than I was anticipating. While they’re not an all-day heel, they’re definitely more than just a sitting-around-looking-pretty kind of shoe. Queen of the Skies | Dionysus is quite stable and has a slight platform. I really love the shade of gold on this one because it’s really classy. They’re not something I could put to good use, but I’m sure heel lovers will add this to their collection. Besides, it’s on SALE! The Streets of Gold collection also has a men’s offering: Imperial | Ian. These are brand new and super sharp looking! Many thanks to FlueDaddy Denny for modeling these. 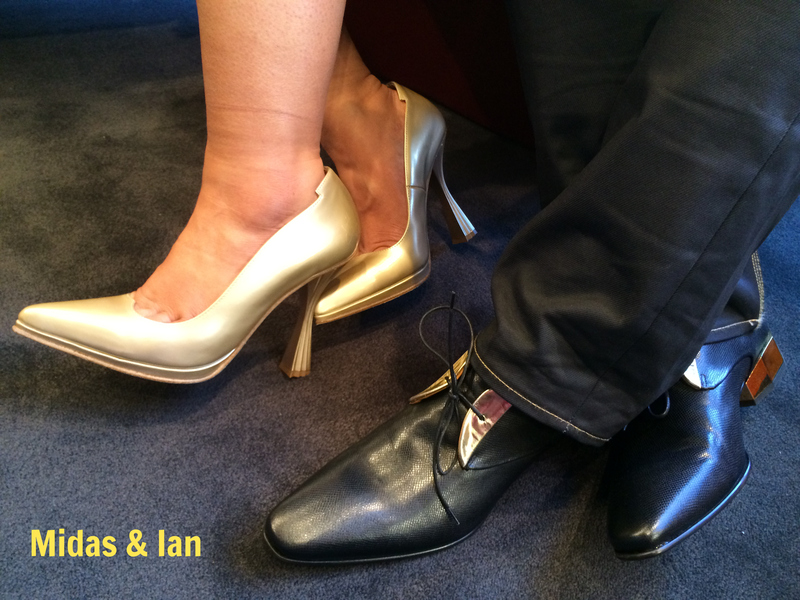 I know a lot of men are looking for something classy that turns heads and Imperial | Ian really fits that need. The black buttery leather is accented with gold near the top and outside the uniquely-shaped heel. Even the most conservative men would give these a try. Below you can see them with the other member of the Streets of Gold, the Queen of the Skies | Midas. 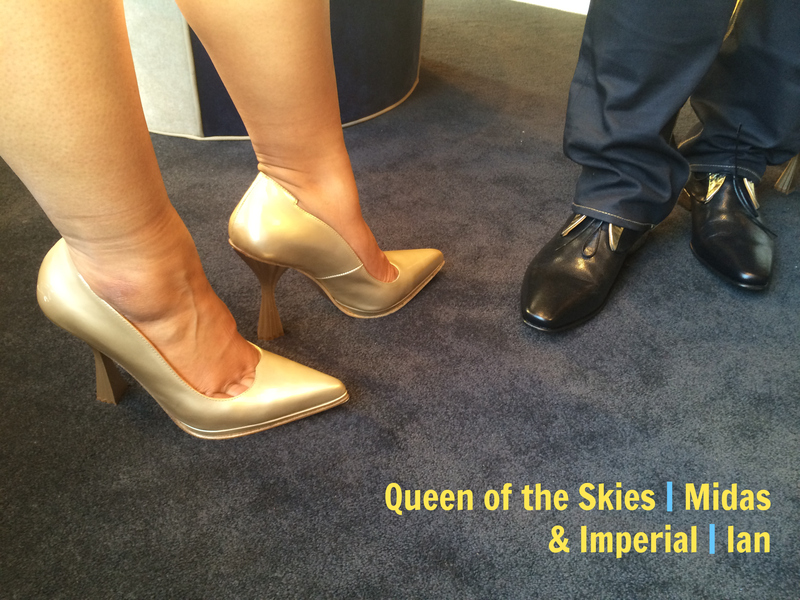 Admittedly, I didn’t like the fit of Queen of the Skies | Midas. It wasn’t as stable and because my feet are so wide, these were a bit pinchy. Then again, I’m not much of a high heels or pumps person. However, for the right person, these are gorgeous. Did you notice the toe cleavage?! Super hot! These are also on SALE! Our friends at Haight Street shared a few things about this collection. One of the signature things about the Streets of Gold are the soles. The gold you see leaves subtle flecks wherever you walk. It’s how the shoes leave its mark wherever you go. Cool, huh? I should note that the red you’re seeing on the photos above are reflections of Madame Shirley’s top:) So… Have any of you checked out the Streets of Gold? If so, what are some of your impressions? What would you like to see added to this line? Please post to comments. Categories: FlueReview, FlueSteals | Permalink. If you haven’t already, now is the time to check out the annual summer sale. SERIOUSLY! Rita is now on sale for $199. A few months ago, I reviewed these lovelies here. They are totally hot, unique, and surprisingly comfy. 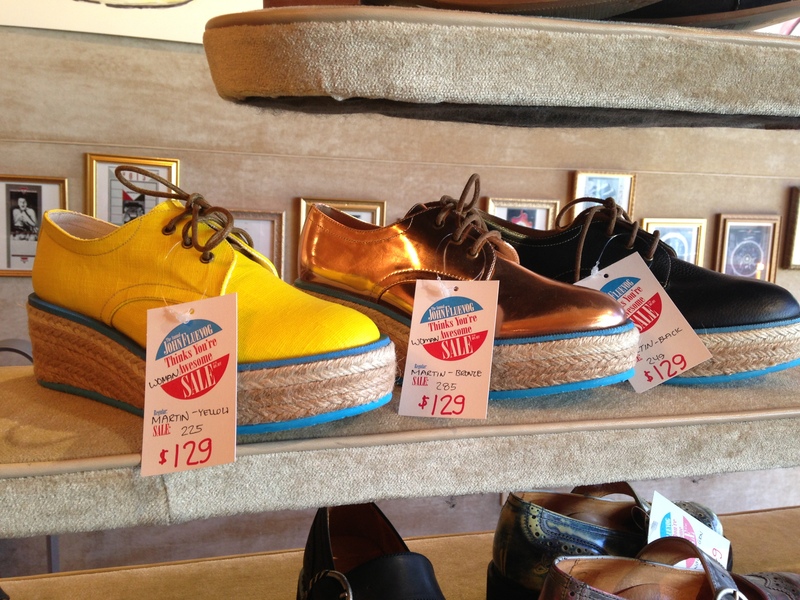 In fact, if you look at that same post I reviewed Rita, the other Vogs featured are also marked down. Yay! I must mention these for my gal Gladys. As you may already know, Gladys is a huge Amie fan and has these in multiple colors. She rants and raves about them here. If you’re in the market for a good ballet flat, you will be happy to know that a good number of their colors have been marked down to $99! Sigh. My wallet is hurting right now. Will the FlueFairies please send them in size 9.5 in grey to me? If not, please buy a pair in my honor. I’ll love you for it! a) Set a price limit. Overpaying for a used pair of Vogs is never a good thing. 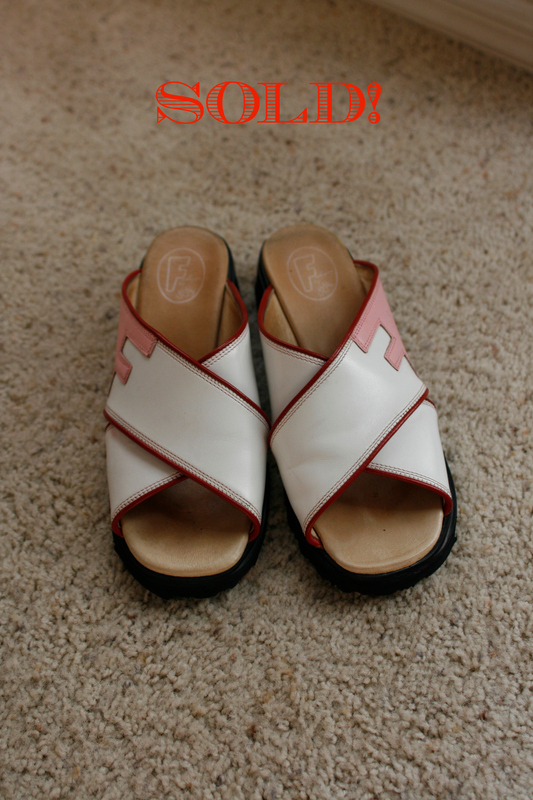 Believe me, there’s an eBay seller that has some killer vintage Vogs. However, I’d never buy from him because his prices are too high. For example, he has a pair of Hi Choice | Hopes for under $300. I bought mine for under $90. Setting price limits is important. b) Don’t buy it just because it’s cheap. Anything I add to my collection has to really add to my collection. If I know I’m not going to use it, there’s no point in buying it. c) Make sure it’s going to fit. I’ve been around Vogs for a while now and I have a sense of how certain families will fit. This can get tricky with the older styles. For fit info that’s out of my purview, I always consult with the dealers. They always give good advice. d) The Vog has to have some life left. Though Fluevogs can last many years, used shoes are still used shoes. Some people abuse their Vogs more than others. Be sure that the Vog you’re investing in is in good condition. Don’t be afraid to ask the seller questions. When I bought Margie, I knew that there was a lot of scuffing and such. However, the shoe itself was in great condition. After refurbishing, Margie has lots of life left! e) It has to be worth the $$ spent. This is related to my first point. Again, I bring up some of the eBay sellers who list some great vintage stuff. While vintage definitely has its value, $300+ for used Vogs is a bit steep – especially since you could likely get new Vogs for that much or less. At the end of the day, I like to feel like I paid a fair price. Someone’s loss was my gain. I’ve been wanting these F-Shoes for a while. Luckily, a kind soul listed these on eBay for $50. They were in perfect condition and fit wonderfully! They are my go-to weekend-in-jeans Vog. In looking at Shirley’s new collection, I count around ten pairs that she purchased for under $100 (including a gorgeous one-of-a-kind sample). She didn’t even have to take any of them to a cobbler for refurbishing! In my personal collection, I have at least four pairs that were under $75. Vintage Vog shopping is a great way to build your collection. I had been wanting a pair of heart-heeled boots for ages! An eBay seller listed these used for almost $300! Luckily, I found these for under $90. 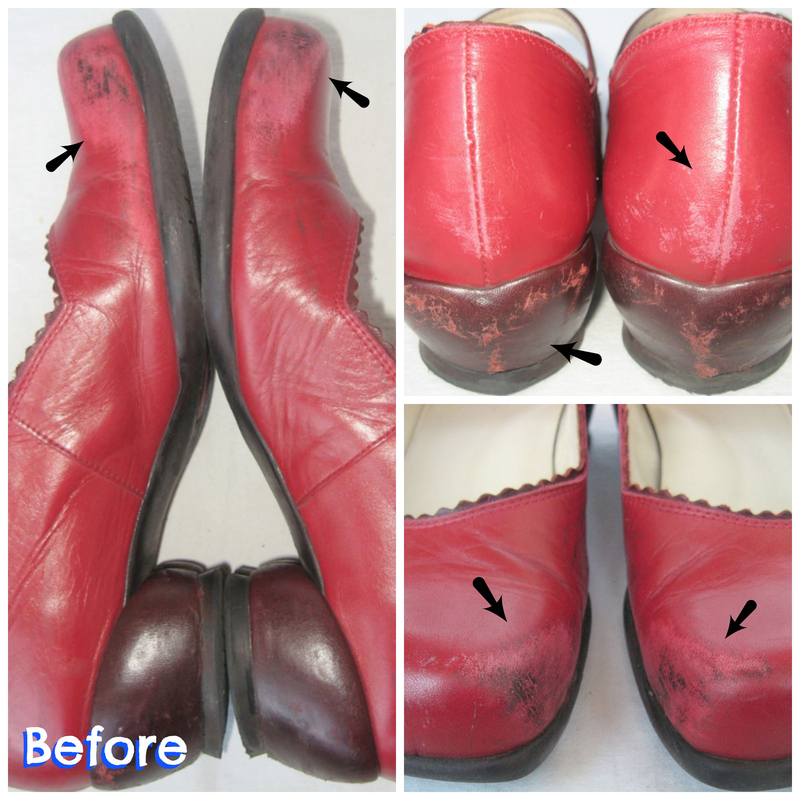 All they needed was a coat of leather lotion and the heel needed to be re-enforced by a cobbler (a $7 repair). For those of you who are on a tight budget and have been loving Fluevogs from afar, please don’t lose hope. There are ways to own a pair or two and still have $$ left for rent and bills! Categories: Flueddict Spotlight, FlueSteals, Vog Collected | Permalink. ATTENTION! Starting TODAY, Fluevog will be having its semi-annual sale. That’s right. Fall is around the corner and your local Fluevog store is cleaning house. This means excellent savings for you! Yesterday, I had the fortunate luck of checking out the preview sale at Haight Street. Let me tell you… there are some excellent finds! Before I get to my personal picks, there are some tips I’d like to share…. 2) Colors are limited. While the Vog you’ve been drooling over may be on sale, the color you want may not be marked down. Please don’t take your disappointment out on your local dealers. Unnecessary whining won’t get those Vogs marked down. Besides, bad Flue-karma is just… bad. 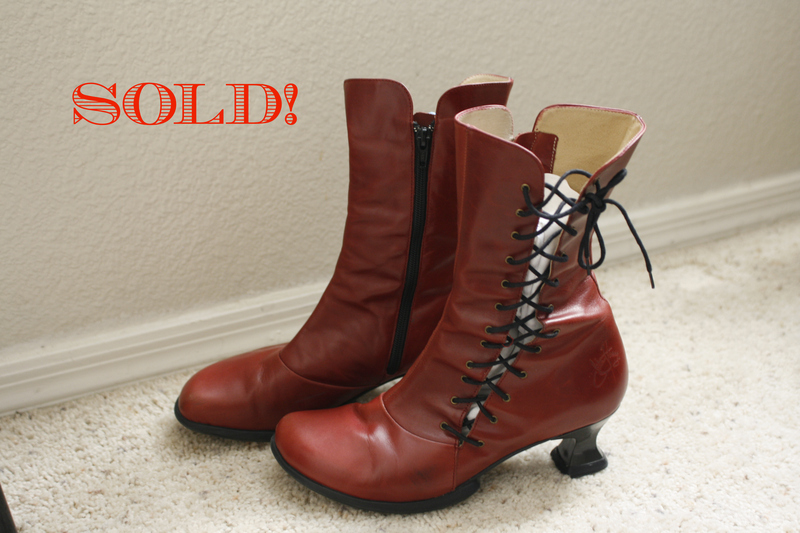 3) If your local Fluevog store is out of your size, tell you dealer stat! They can check if other stores have what you’re looking for. If they find it, they can help you arrange to have them shipped. 3) For those of you who don’t have the luxury of having a Fluevog store nearby, do check-check-and double check on sizing. Fluevog dealers have excellent knowledge about sizing, so make sure you call. Of course, I’m going to recommend that you call Haight Street at (415) 436-9784. They are my personal go-to people about sizing and their advice is always on par! 4) This last piece of advice comes from my sense of practicality. If you’re scouting the sale and just don’t find something you like or your Vog of choice is out of stock, don’t fret. Save your dollars because fall is coming and I’m sure there will be something with your name written on it! On to my picks (click on the photo to be directed to the Fluevog site)…. Lo and behold. One day I’m ranting and raving about the greatness of the Daily Miracles | Stunner, and the next day, the Stunners go on sale. How awesome is that?! Integrity | Amie. A total Gladys pick! Espadrille | Martin. As of this posting, the Martin is not available online. Please call your local Fluevog store directly for sizing and ordering information. Gateways | Brandenburg Light. Available for men and women. Summer has just begun and some of the season’s hottest Vogs are now on sale. Take advantage of some great colors and styles. In particular, if you’ve been drooling over the Guides, the yellow ones have just been marked down. They’re gorgeous and so easy to wear. Also in the family (but not photographed) are the Portage. Can someone please buy the lilac in size 9.5 in my honor? I’d really appreciate it! For the gentlemen, the Gateways | Brandenburg Light in select colors have been marked down. While I didn’t take pics of the men’s collection, please note that there are some wonderful savings there too! Categories: FlueSteals, Hot Vog Find | Permalink. Every now and again when I peruse the Fluevog Facebook page, it never fails that someone will put up a post declaring that while Fluevogs are absolutely gorgeous, they’re not quite budget-friendly. As a former struggling graduate student and a totally underpaid lecturer, I can definitely relate to the hole that burns in my wallet from buying a pair of Vogs. However, there are ways one can build a Fluevog collection on a limited budget. Today, I bring you the power of refurbishing. Recently, I scored a great deal on the Choice | Margie on ebay. As you can see from the photos below, they were scuffed pretty badly. Margie has been on my vintage wish list for ages and given the low price, I knew that with some TLC, I could revive these babies! I could tell that the base of the shoe was in great condition (made with leather) and that the refurbishing was primarily cosmetic. Also, the seller was very honest with the condition of the shoes. These photos were provided by the seller. I added the black arrows to illustrate the extreme scuffing. Margie really needed some TLC. 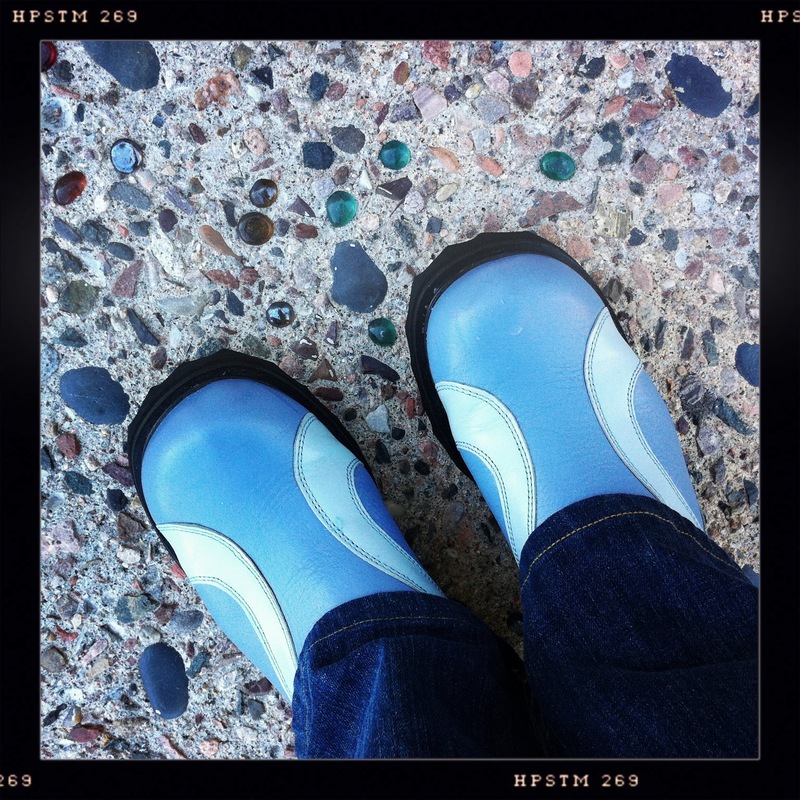 When the shoes arrived, I was glad to see that after adding an arch support, they fit perfectly! (Margie fits just like the Fellowship | Sandra. Because my feet are so flat, I need an arch support for a secure fit.) Yes, they were as scuffed as the photos indicated. I could swear that the previous owner ran them through a sandpaper funhouse! These photos were taken after two coats of leather lotion. (Note: Your eyes aren’t fooling you. The color became much richer and I didn’t use any fancy photo tricks to enhance the image. I’m actually not a fan of altering photos.) What a difference! I wanted to see if I could refurbish these on my own. The first thing I did was revive it with some leather lotion. 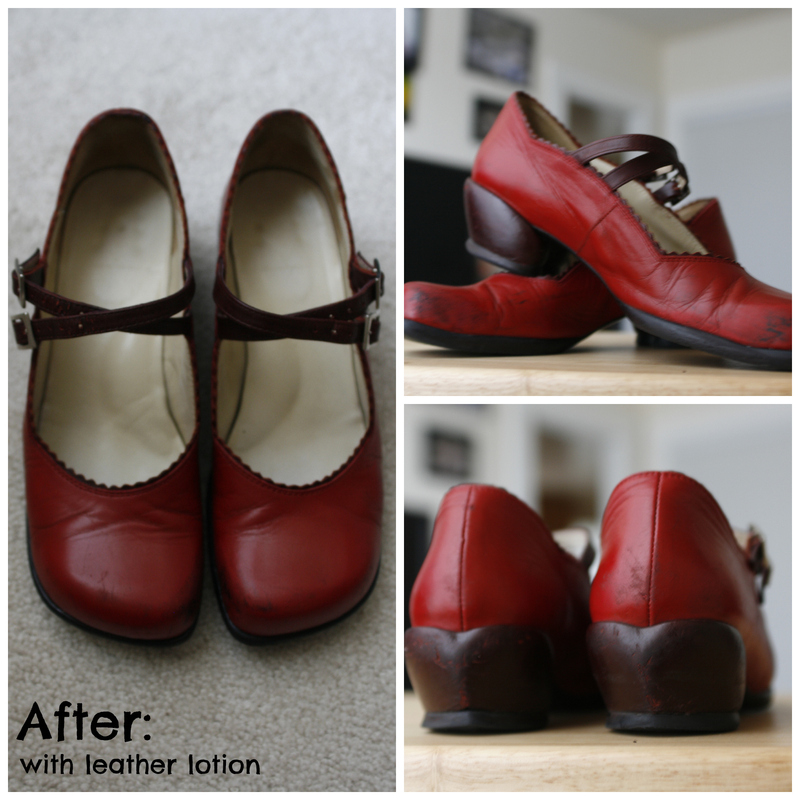 As you can see from the photo above, the leather lotion gave Margie a much richer color and made it look less dried out. If you’re a Vog user and you don’t own a bottle of leather lotion, you need to get yourself a supply, stat! I’m obsessed with leather lotion. Once a Vog comes home with me, it doesn’t see the light of day without a coat or two of the stuff! It helps preserve the shoe, soften the leather, and keep the color nice and rich. You’d cry if you ever saw my Vog collection. They all look pristine because of my leather lotion obsession! Taken after bringing them to Pioneer Renewer to have Margie refurbished. 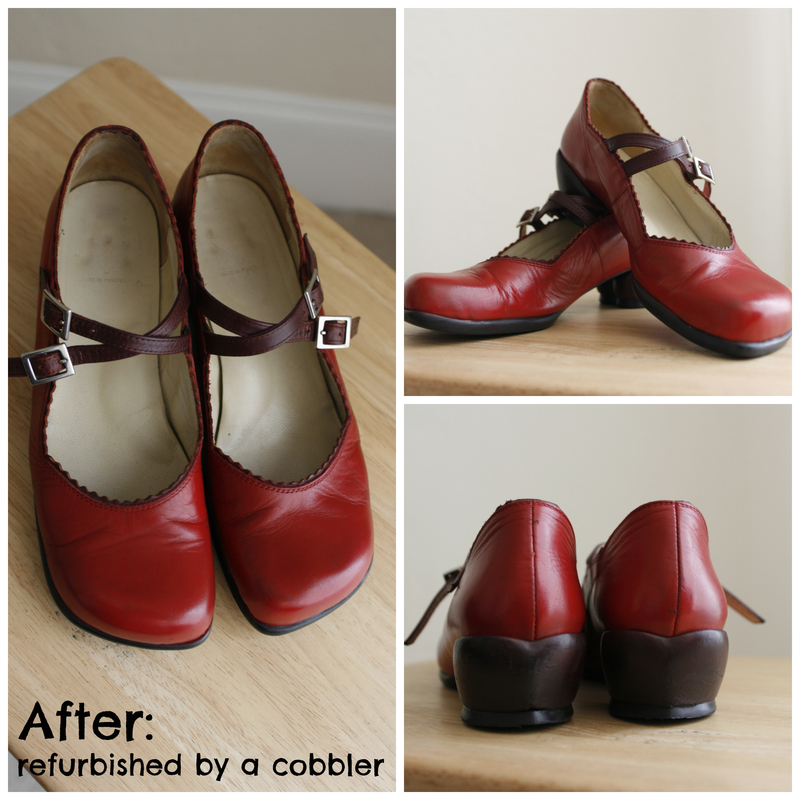 A good cobbler does wonders! As you can see, the color is much richer and the scuffing is virtually gone. In person, you can see the wear and some of the texture issues. Otherwise, they’re perfect. They look like a comfortably worn pair of Vogs. I can’t believe how amazing they look now! Another advantage of refurbishing Fluevogs is that it’s a great way to re-cycle fashion. Though Margie was someone else’s trash, I definitely transformed her into my new treasure! Categories: FlueSteals, Vog Collected | Tags: refurbished | Permalink. Hello all! Just wanted to share some info from Gladys. If you’re an Amazon shopper, they just marked down some items from the current spring collection. Click on the sale sign to get more details. Happy shopping!